Beasts of the Southern Wild makes you want to celebrate independent movies. Benh Zeitlin’s near-masterpiece features the debut performances of actors, it’s his own first feature film, and much of the production crew is made up of people that lived around the area it was filmed. It’s different than some of the things the Sherwood Baptist Church puts out – while a film like Facing the Giants features similar ambition and credibility for effort, Beasts of the Southern Wild has the added benefit of a fantastic screenplay (written by Zeitlin and Lucy Alibar which would have been hacked and smashed by a major studio) and incredible performances. At the center of the film is The Bathtub, a name used for a low-lying part of Southern Louisiana. It’s a rather small poverty-level community, filled with people that have hit hard times. There’s still a deal of well-being among them, no matter how minimal or unapparent. 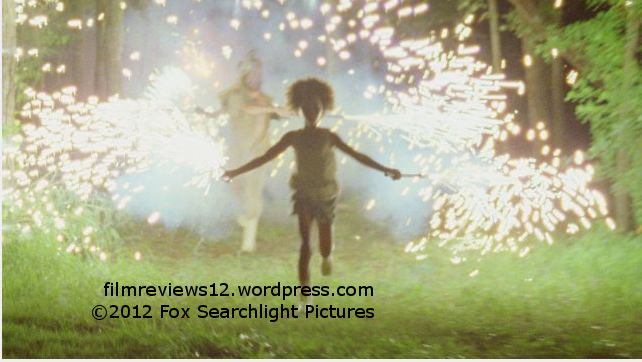 Two residents of The Bathtub are Hushpuppy (QUVENZHANÉ WALLIS), a determined, frank girl of about 5, and her father, Wink (DWIGHT HENRY), who sometimes disappears and returns in a hospital gown, which Hushpuppy associates with a dress. Wink isn’t the best father, but there is an unquestionable important relationship between them. Hushpuppy’s mother left a long time ago, but Wink has told his daughter many stories about her. The film is peppered with stock footage of melting glaciers in the Arctic, which leads to a massive storm sweeping through The Bathtub. This in turn leads to a series of events which accumulates in a sweeping finale, understated in literalism but epic and poignant in scope. The only problem I could find outright with Beasts of the Southern Wild was a recurring issue with the cinematography. Like far too many dramas of its kind, Zeitlin attempts to express realism through a strange form of visceral cinematography, and a majority of it (most notable in the first half of the film) is shot with a shaking handheld camera. All it does is come close to ruining the otherwise wonderful choice to film on 16mm. I’ve never liked the practice of shaky-cam, and here it is nearly as egregious as The Hunger Games. But that is the only real problem – the other aspects are close to perfection. Wallis, as you may have heard, is phenomenal as Hushpuppy, displaying a wondrous performance that many child actors (and more than a few adult ones) can’t match. It is said she beat out four thousand other girls for the role. A lesser praised but still vital performance is Henry. He displays illness and confliction in a commendable and believable way. 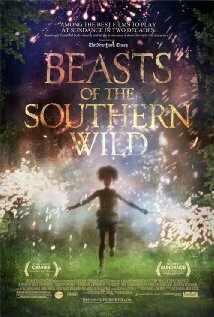 It is said that Beasts of the Southern Wild is based off a play by Lucy Alibar. I can’t really imagine this playing out on stage – it is cinematic in its storytelling and execution, the most notable being a fascinating motif in long-extinct aurochs, the predecessor of modern day cattle. According to Wikipedia, the last one died in 1627. In the movie, they appear as an imposing figure; most notably in the climax, after being briefly alluded to earlier in the film. I wish I could go into detail about it, but that would ruin your own experience of this very good movie. While I can’t forgive the cinematography, every other technical and creative aspect of the film shines, including a musical score written by Zeitlin and Dan Romer. I recommend this film. It is heavy and thought provoking. It contains hits of both uncertainty and stability. Beasts of the Southern Wild is brilliant.